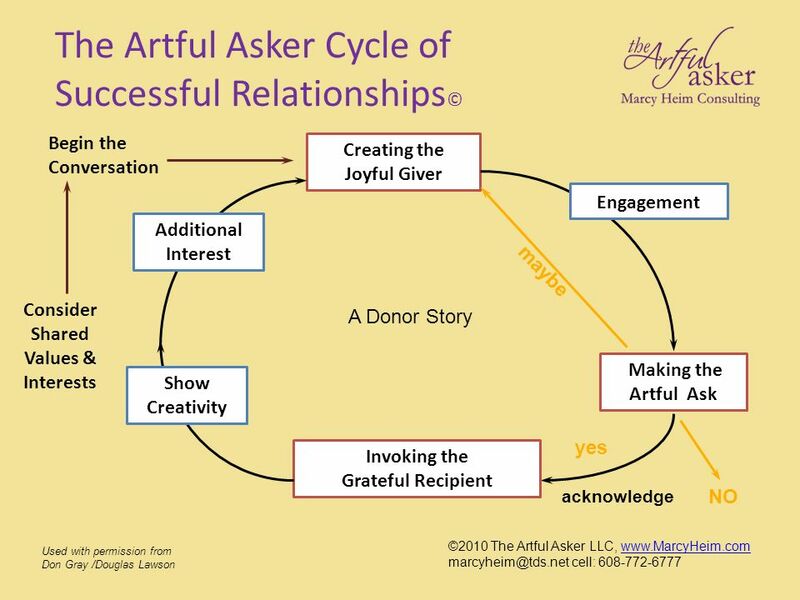 Why people give/the Words we use The Cycle of Successful Relationships – overview Making an ask & WRITE your ask! Throughout – Our MINDSET! 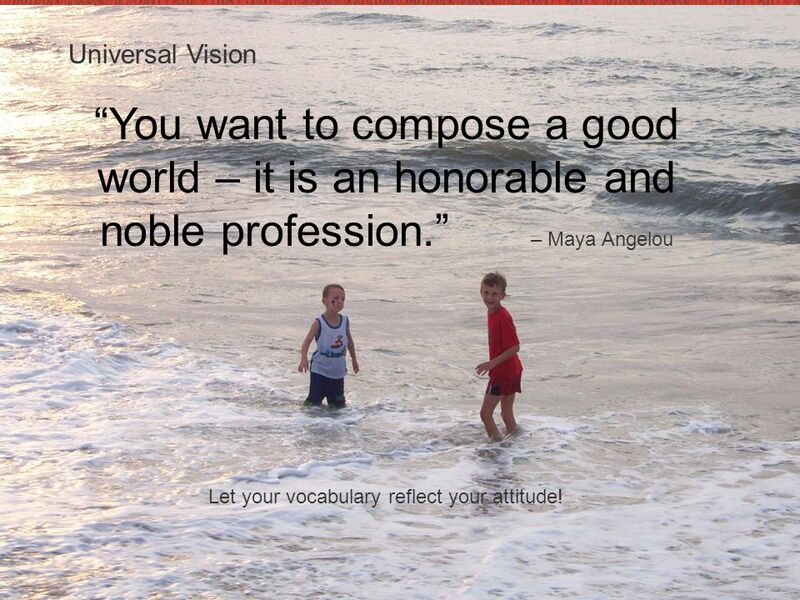 8 Universal Vision “You want to compose a good world – it is an honorable and noble profession.” – Maya Angelou Let your vocabulary reflect your attitude! 9 And every day, it is your choice. 14 Why are the words we use so important? 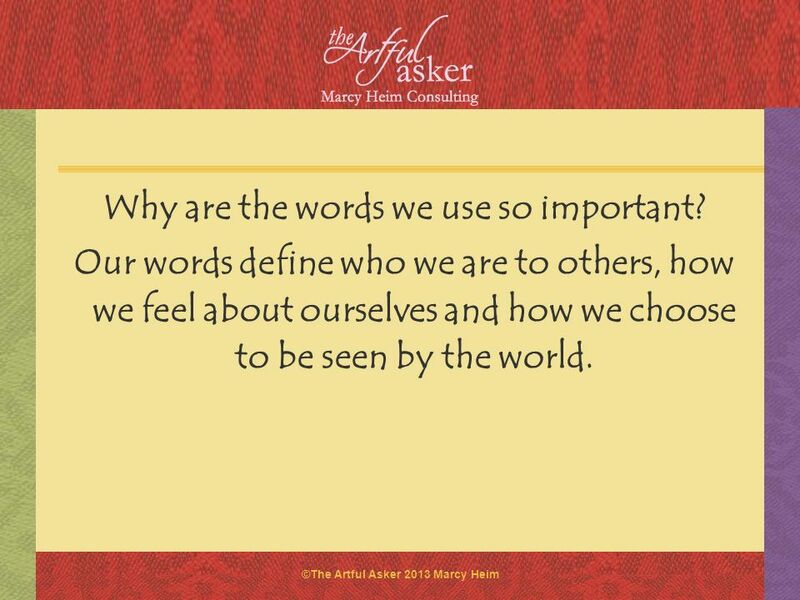 Our words define who we are to others, how we feel about ourselves and how we choose to be seen by the world. 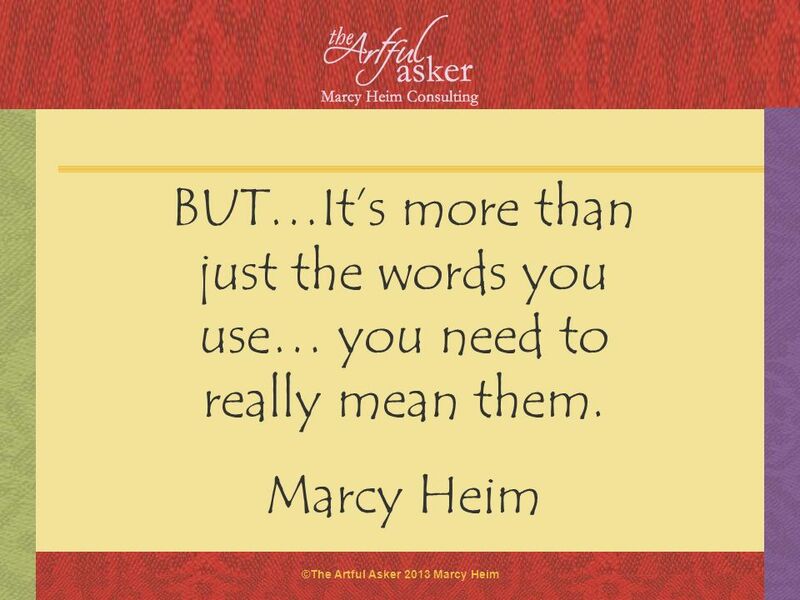 15 BUT…It’s more than just the words you use… you need to really mean them. 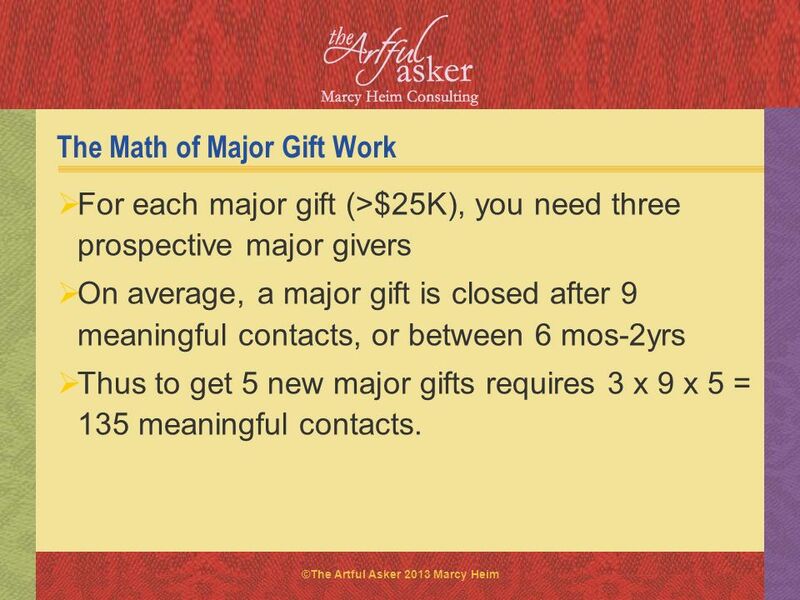 For each major gift (>$25K), you need three prospective major givers On average, a major gift is closed after 9 meaningful contacts, or between 6 mos-2yrs Thus to get 5 new major gifts requires 3 x 9 x 5 = 135 meaningful contacts. 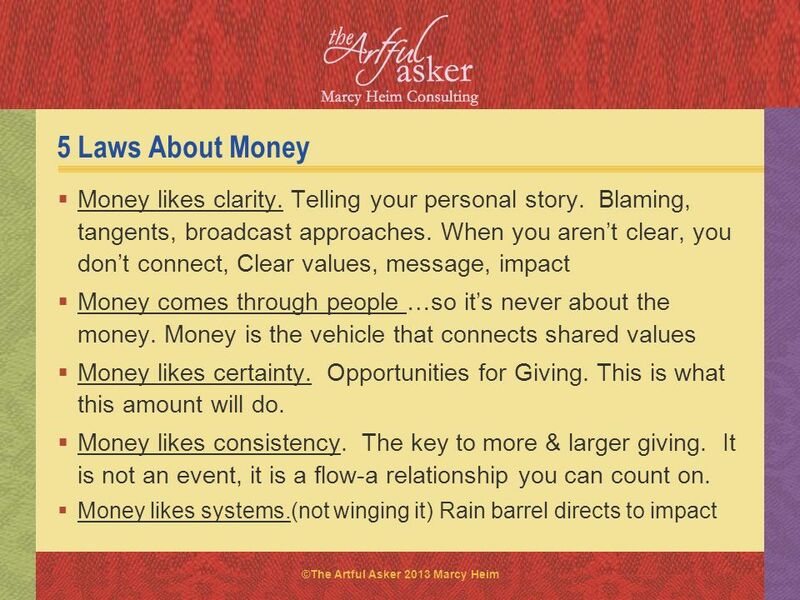 Think about people like you---who share your values and interests Be VERY clear on why you champion, invite and invest – money likes clarity Make connections between opportunities to give and givers’ interests with your needs Share your story– anywhere and anytime! Make communicating with others a priority – newsletters, website, etc. Telling the story! Board/volunteers play a key role here for their own 1:1 connections & to connect staff – Money comes through people. Consistency. Let the relationship evolve – Grandchildren syndrome Create EXPERIENCES – big and small to be involved and see first-hand the impact (Invite) Talk/listen about what you need – get to dollars/impact Money loves certainty. 26 Major Issues in Asking What are the important linkages? How much do you ask for? Who makes the ask? Where is the best location to make an ask? 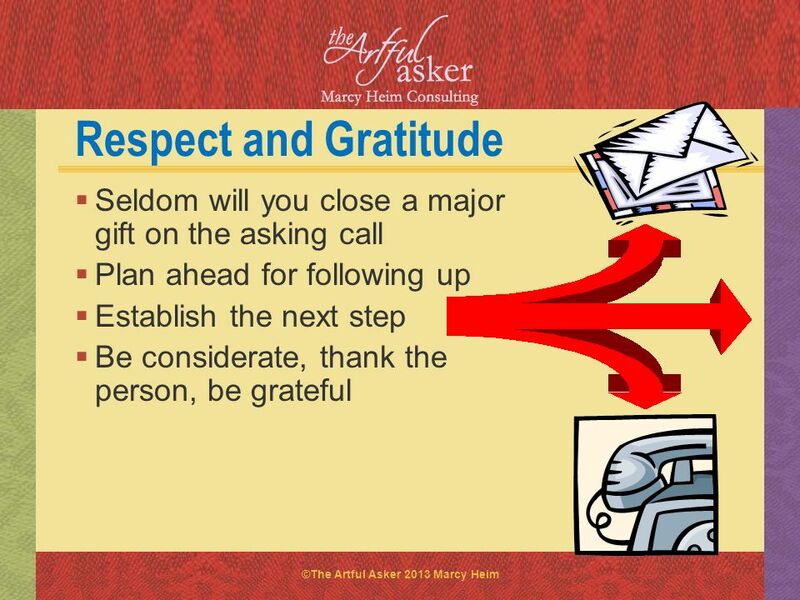 What do you send out ahead of the call? When is the timing right? 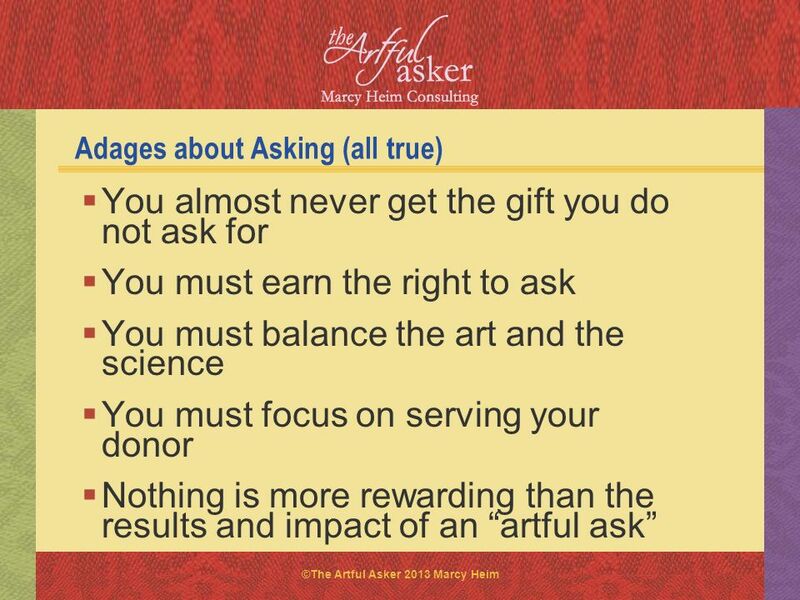 How do you make an artful ask? Common pitfalls in making an ask? 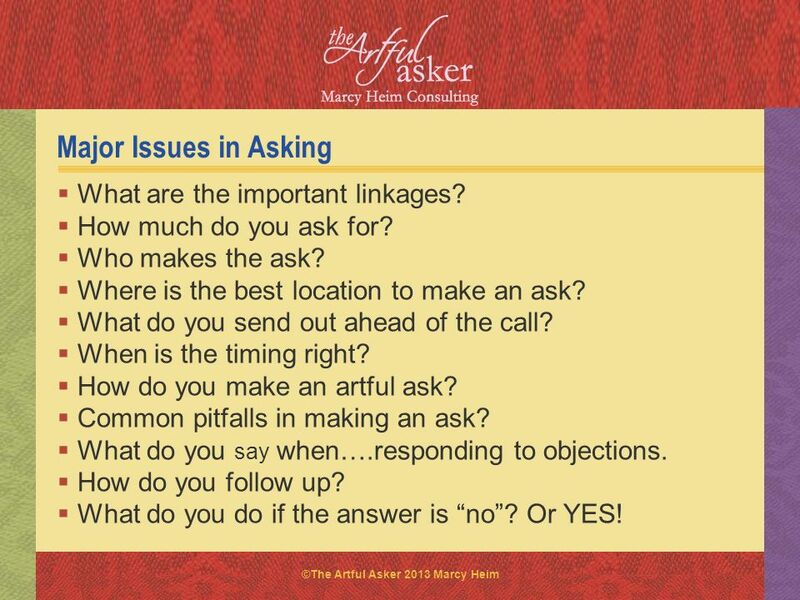 What do you say when….responding to objections. How do you follow up? What do you do if the answer is “no”? Or YES! 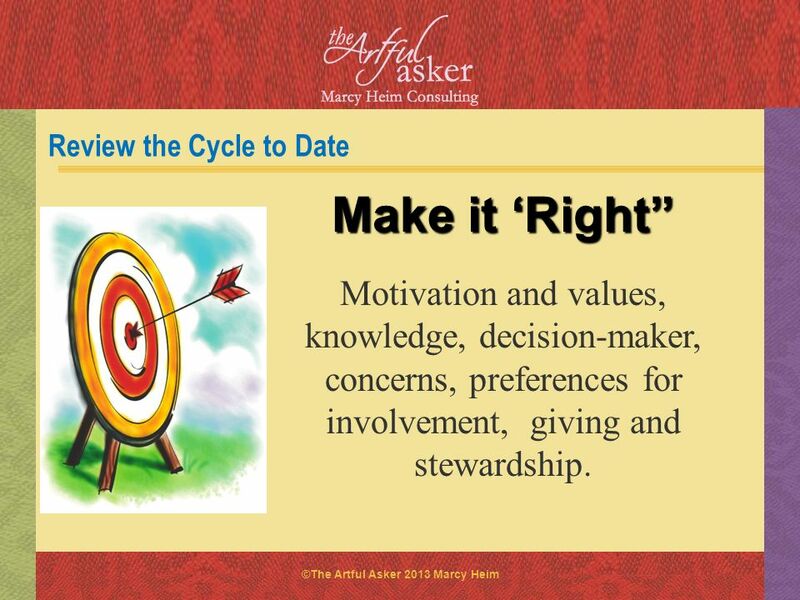 Make it ‘Right” Motivation and values, knowledge, decision-maker, concerns, preferences for involvement, giving and stewardship. 29 How Much do you Ask For? 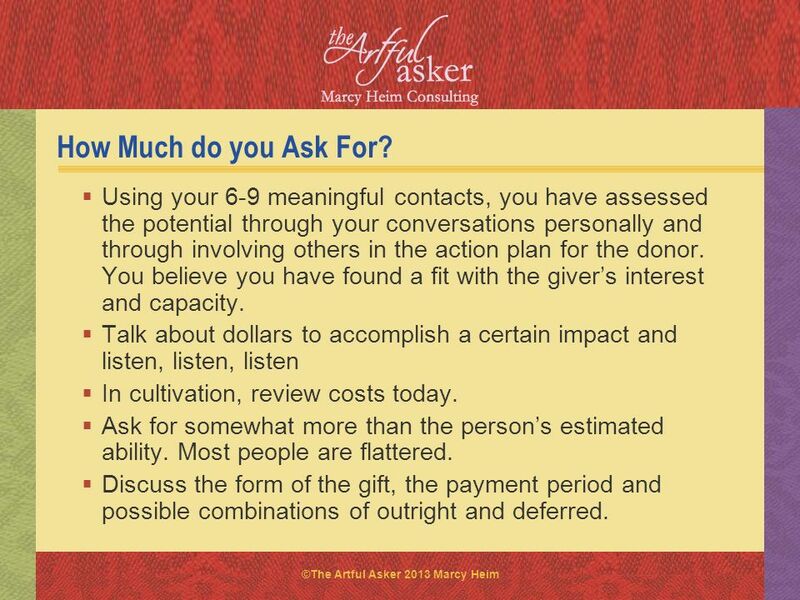 Using your 6-9 meaningful contacts, you have assessed the potential through your conversations personally and through involving others in the action plan for the donor. 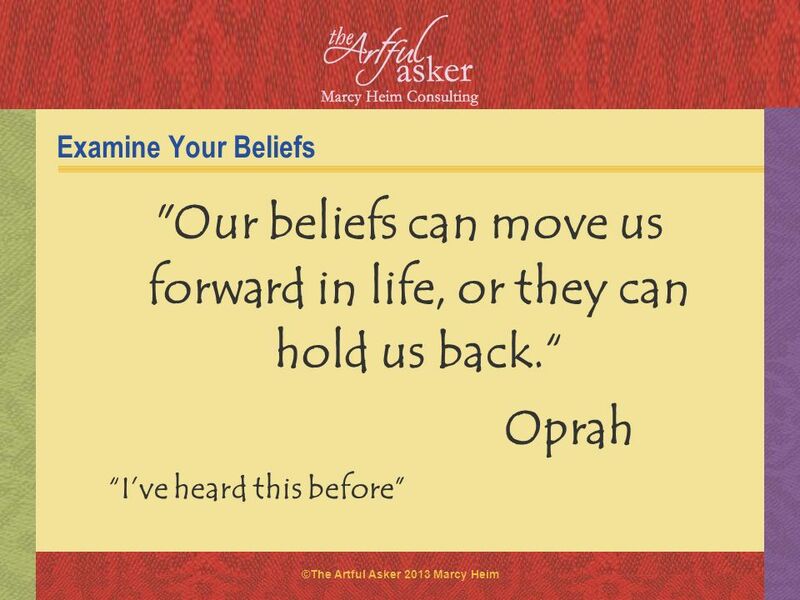 You believe you have found a fit with the giver’s interest and capacity. Talk about dollars to accomplish a certain impact and listen, listen, listen In cultivation, review costs today. Ask for somewhat more than the person’s estimated ability. Most people are flattered. Discuss the form of the gift, the payment period and possible combinations of outright and deferred. 30 Who makes the ask? 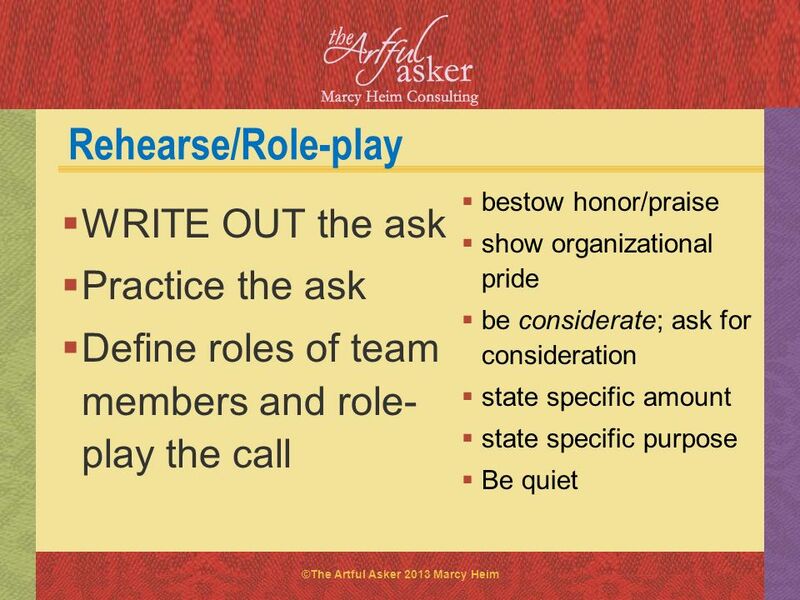 The development professional generally “speaks the ask.” A high ranking administrator. A volunteer or board member. An “expert” on the project Who should be part of the team to visit with David about his gift? 31 Where is the Ask Made? 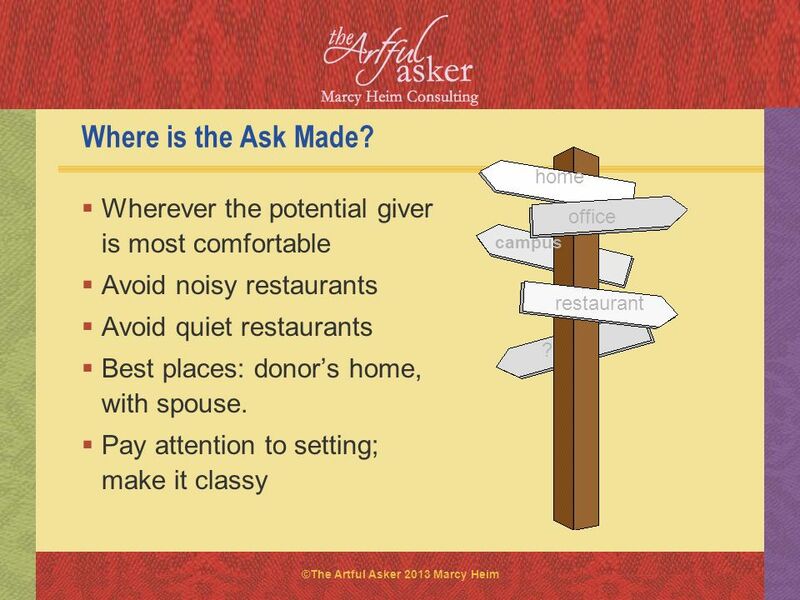 home Wherever the potential giver is most comfortable Avoid noisy restaurants Avoid quiet restaurants Best places: donor’s home, with spouse. Pay attention to setting; make it classy office campus restaurant ? 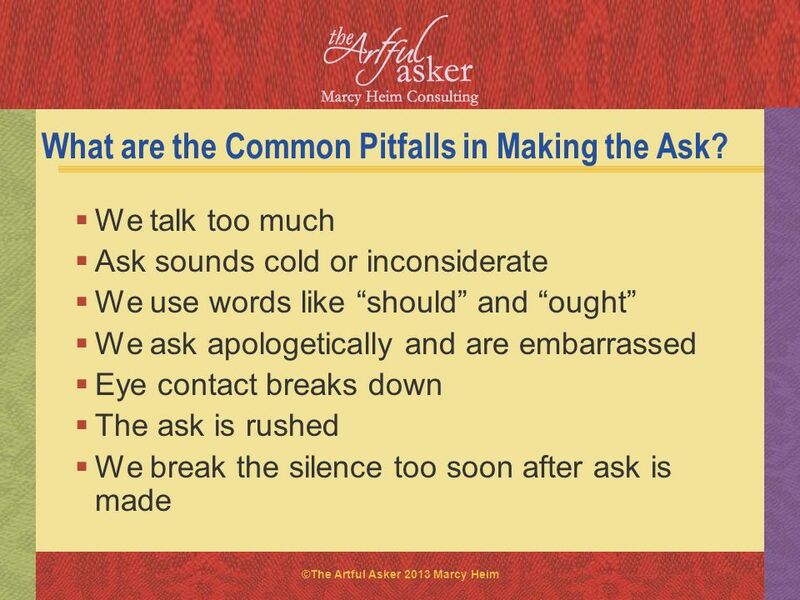 34 What are the Common Pitfalls in Making the Ask? 39 What Do You Do if the Answer is “YES”? 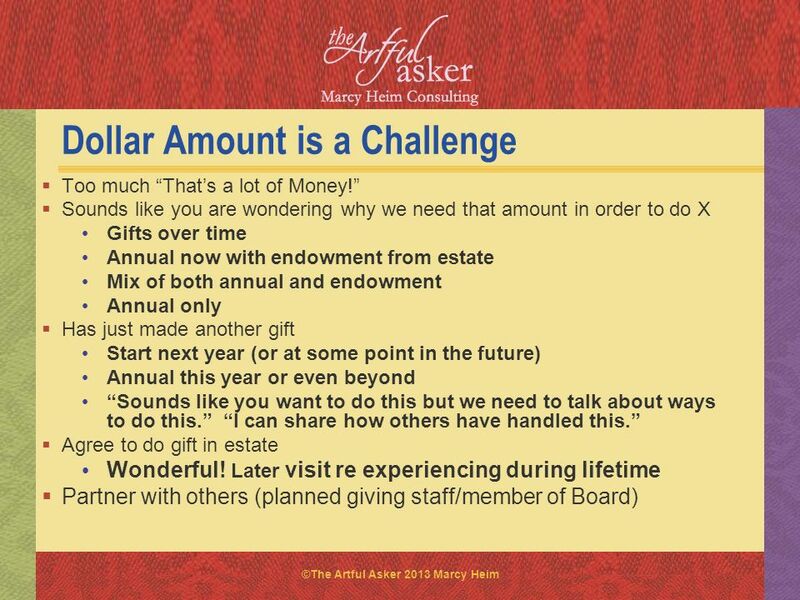 40 Multiple asks The annual fund is still the annual fund accomplishing all it does. Planned gifts provide amazing options for your major gift donors. 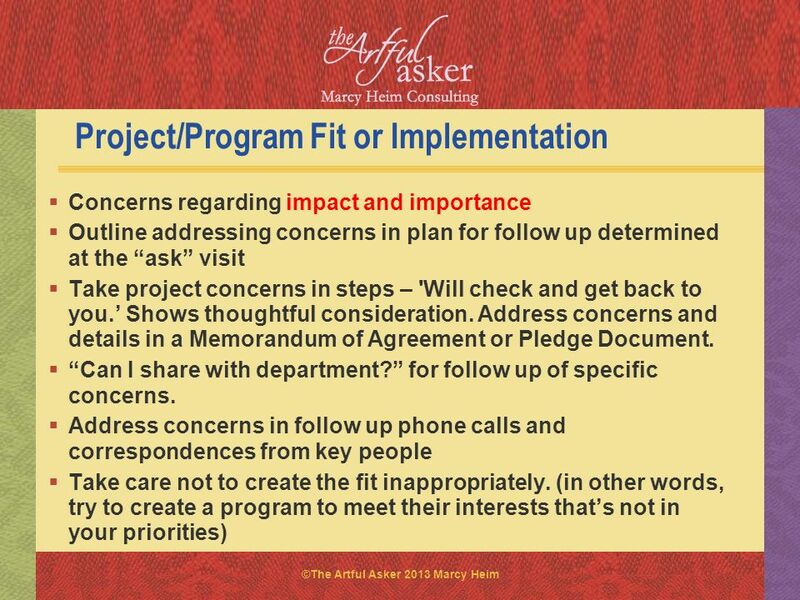 Donors support causes/projects/programs of interest to THEM. 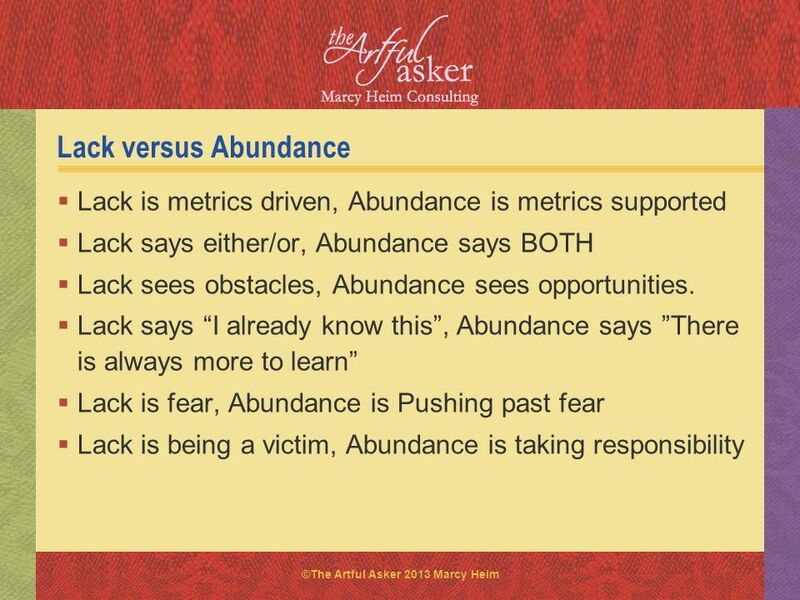 In other words: DON’T ASSUME…. YOU KNOW WHAT YOUR DONOR IS INTERESTED IN. THEY WILL BE OFFENDED BY THE ANNUAL FUND ASK. THEY WILL GIVE YOU LESS IF THEY SUPPORT SOMETHING ELSE. THEY NEED YOU TO CONVINCE THEM. THEY WILL BE OFFENDED BY MULTIPLE ASKS. 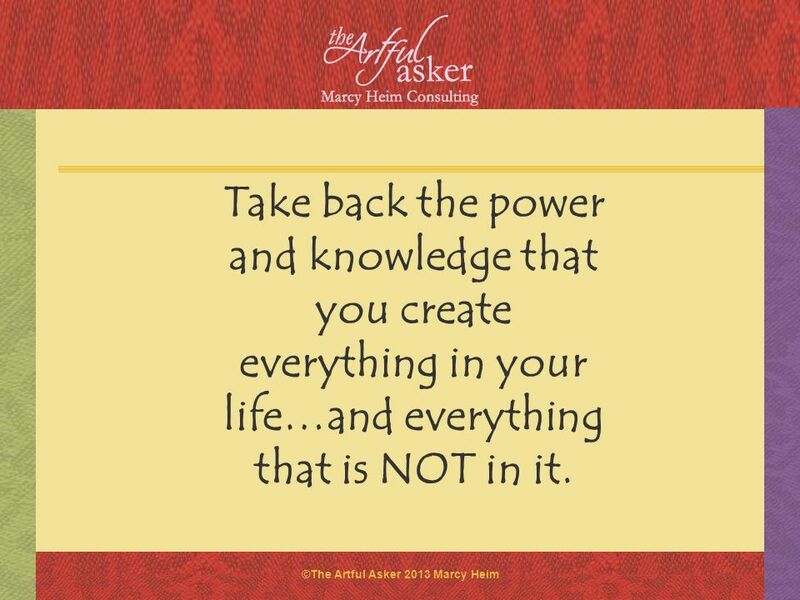 43 Take back the power and knowledge that you create everything in your life…and everything that is NOT in it. 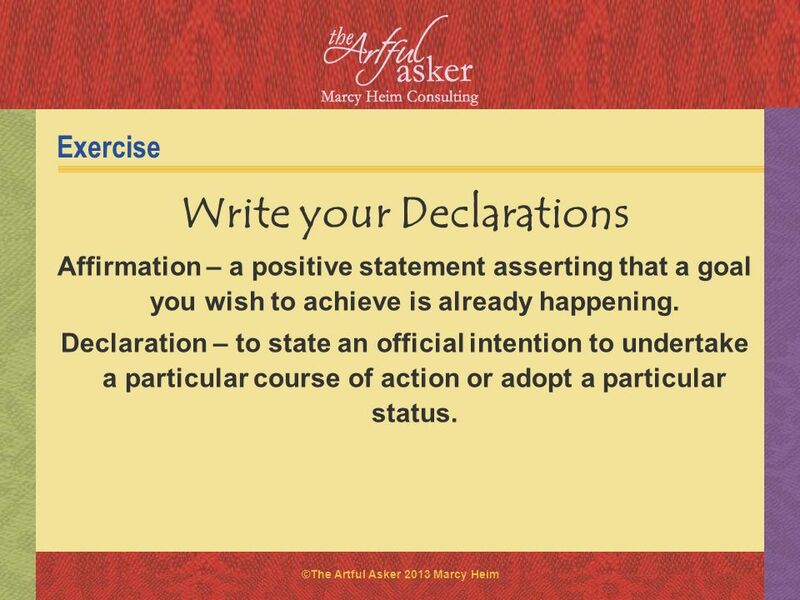 Exercise Write your Declarations Affirmation – a positive statement asserting that a goal you wish to achieve is already happening. Declaration – to state an official intention to undertake a particular course of action or adopt a particular status. Respect and honor your donors. As you deepen your relationships, be true to shared values and have honorable goals. Employ metrics to serve the relationship-building process and to help you organize and record the information needed for you to best help your donors accomplish their giving goals. What is measured, grows. 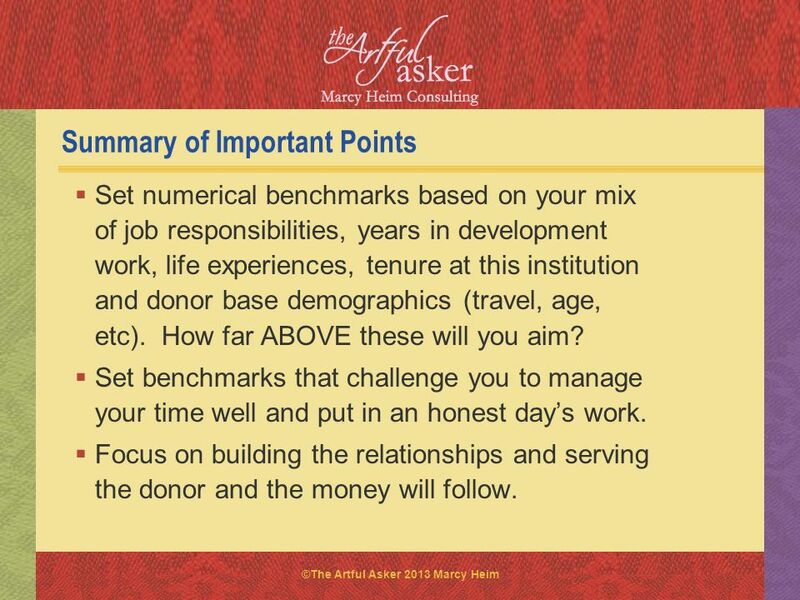 Set numerical benchmarks based on your mix of job responsibilities, years in development work, life experiences, tenure at this institution and donor base demographics (travel, age, etc). How far ABOVE these will you aim? Set benchmarks that challenge you to manage your time well and put in an honest day’s work. Focus on building the relationships and serving the donor and the money will follow. 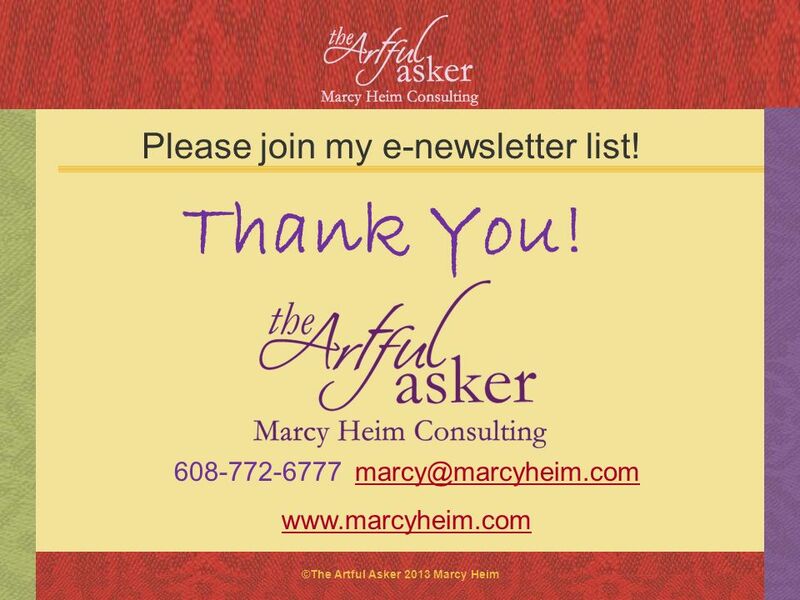 Please join my e-newsletter list! Thank You! 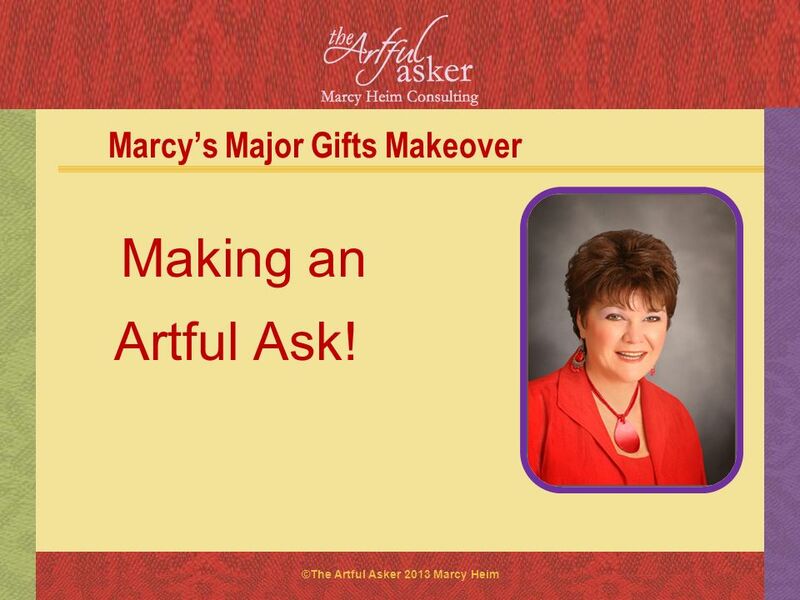 Download ppt "Marcy’s Major Gifts Makeover"
Whither Private Fund Raising & Development? or Nobody Told Me Id Be Raising Money! 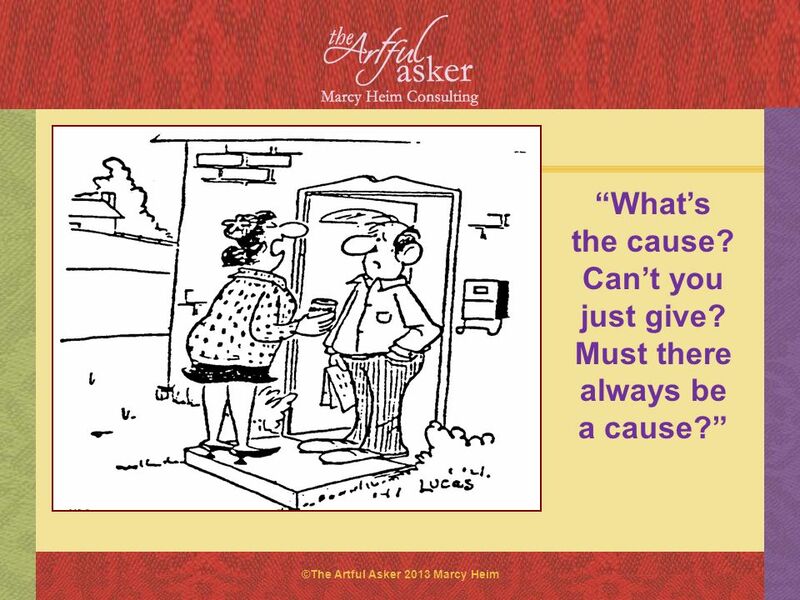 Fundraising 101 “Fundraising is the gentle art of teaching others the joy of giving.” -Hank Rosso. Presented by Jerry F. Smith, CFRE President & CEO J.F. Smith Group, Inc. Northeast Annual Giving Conference March 21, 2012. Best Practices in Fundraising Identification – Cultivation – Solicitation - Stewardship Presentation and Moderation by Jay Ornellas Panel & Group Discussion. Legacy Giving Building Blocks A Simple Approach to Attracting Long-Term Support Money for Our Movements August 13, 2010 Greg Lassonde, CFRE Legacy Giving. Major Gifts, Relationships, and Patience— A Workshop for Academic Leadership Donald R. Gray April 27, 2003. 2010 Education Foundations Conference Oshkosh, Wisconsin November 18, 2010 Donald R. Gray. From the work of Paul Axtell Conversation A spoken exchange of thoughts, opinions and feelings; talk. 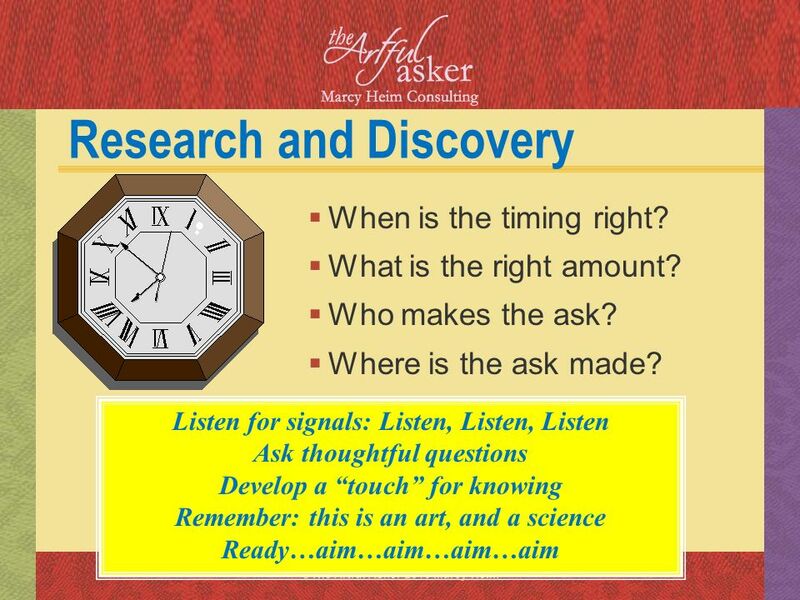 Interview Skills for Nurse Surveyors A skill you already have and use –Example. Talk with friends about something fun You listen You pay attention You. 1 Introduction to Athlete Leadership. Course Overview 2 Part 2: ALPs and You Part 1: Overview of ALPs Part 3: Your Mission Statement.